The number of free papers in Stockholm just keeps increasing. 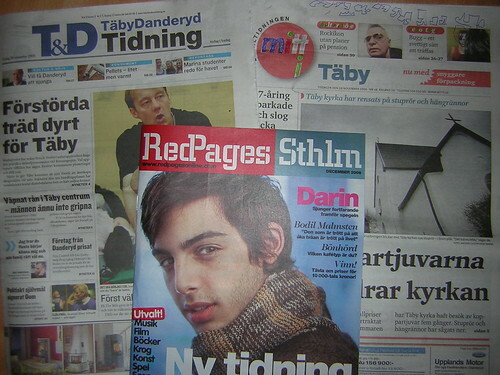 Today I got three (3) papers in my mailbox: Täby Danderyd Tidning (still free, who’s surprised? ), Mitt i Täby and now also RedPages Sthlm. The latter is launched as a new paper about culture and entertainment in Stockholm, distributed 8 times per year. Although one could easily question whether this is a paper or just direct marketing dressed up as a paper. The overall quality is quite poor and RedPages’ webpage adress is published on the front page, but the URL doesn’t work. Instead one has to go to www.redpagesmedia.se to find more info. Dagens Media also speculates today about a new free daily from Metro that is supposed to be launched next year. Sound of Stockholm will be about culture and have a circulation of 40,000 copies. Add to this, the three free dailies City, Metro and Punkt SE that is handed out on my way to work and you realize that something’s got to give, soon. All the multitasking in the world can’t support all these papers (I also have Dagens Nyheter and Dagens Industri in my household). One definition of fatigue is “a feeling of excessive tiredness or lethargy, with a desire to rest, perhaps to sleep. Often it causes yawning.” That’s the feeling I get from this flood of freesheets. Footnote: Additional artwork on Mitt i Täby by my oldest daughter. Tags: RedPages, freesheets, free dailies, RedPages, media. Ping.